The 6-foot-2 180 pound receiver preps at Archbishop McCarthy High School in Ft. Lauderdale, Florida. As a sophomore he had 12 receptions for 415 yards–a whopping 34.6 yards per catch. In track he runs an 11.27 in the 100m, a 23.6 in the 200, and recorded 19-feet-6.25 inches in the long jump. BYU Insider: Why did you choose BYU? Martin: Mainly because of the support system, standards, the environment in the campus and the atmosphere. The coaching staff showed that they believe in me and trust me through words and actions. BYU Insider: What do you most look forward to in suiting up for the cougars? Martin: I actually look forward to being a part of the family foundation that BYU has. I want to make history as a Cougar and it’s been a dream to play college football. BYU Insider: What other schools were showing you love in the recruiting process? Martin: Texas Tech and BYU so far. There will be many more to come. BYU Insider: What are some of your favorites? Martin: Action Movies, Rap and EDM Music, and Cinnamon Toast Crunch. BYU Insider: What is your greatest accomplishment in sports? In life? Martin: This. Getting my first offer. My greatest accomplishment in life is being a part of a loving family. BYU Insider: What is the best advice you’ve ever received? BYU Insider: Who is a current player (collegiate or pro) that you seek to emulate on the field? Martin: Kirby from the BYU football team. BYU Insider: What are your personal goals for this season (2017)? Martin: To get my weight to 190 pounds by the end of the season, to have 1,300 receiving yards, to be ranked in Top 300 in the nation, and to participate in the U.S Army All-American Game. Martin has not yet been rated by Scout, Rivals or ESPN. 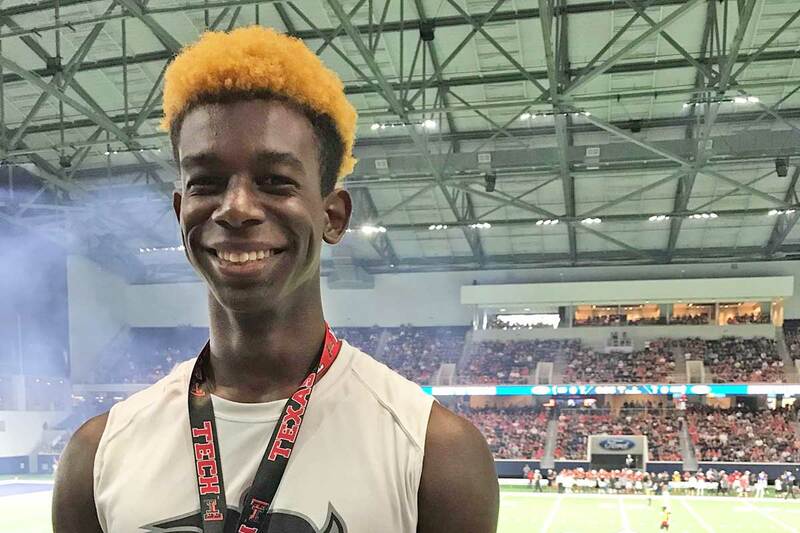 BYU is his first scholarship offer but he has also received early recruiting interest from Texas Tech. Martin trains with BYU alumni Margin Hooks. Class: 2018 HT/WT: 6’2”, 180 lbs. If you have any additional information or insight about this recruit, please include it in the comment section below.